1804 – New Hampshire was designated a separate district. Rochester came under the Tuftonborough circuit. Revs. Warren Banister and Ebenezer Blake preached in Rochester about every four weeks at the school house on Haven Hill. School house was located next to the home of Paul Place, later by Byfield Meserve. 1829-30 – First Methodist Sunday School was established. Previously a Union Sunday School had been held in the village schoolhouse. 1852-3 – Chapel was enlarged by 20 pews. New front and tower were added and an organ was purchased. 1861-2 – Old parsonage was sold and moved to Union St. and a new parsonage was erected. 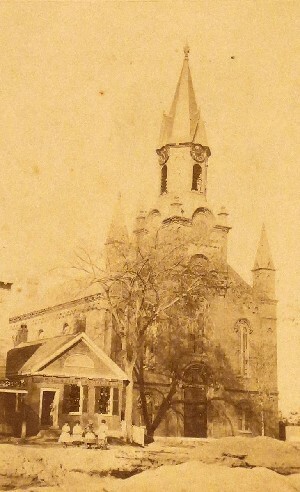 1866-7 - Old chapel was torn down. Cornerstone for present building was laid Aug 1, 1867. 1868 – Present building was dedicated Mar 26, 1868. 1877 – The city of Rochester purchases and installs the clock in the Methodist steeple. 1886 – Organ was moved from the gallery at the rear of the sanctuary and placed on a level with the with the pulpit platform. The platform was lowered by about one third. 1887 – Gallery was removed, angles at the ceiling were arched for better acoustics and the interior was redecorated. Pews added. Nine memorial windows added. 1888 or 1895 – Lighting struck East Tower on the front of the church. Both towers were removed as well as the smaller ones on the steeple. 1906 – Estey organ installed at a cost of $3000. Originally activated by air pressure supplied by a bellows driven by a water-driven motor. 1910 – Addition which houses the choir room, kitchen and rest rooms was added. 1920 – Air supply for the organ was changed to an electric motor driven fan. 1934 – Sanctuary was redecorated, new murals added, organ pipes painted silver, new pulpit and alter table, new chairs, new piano, new communion service, and new collection plates in preparation of hosting annual conference. 1948 – New oil fired furnaces installed in the basement. One heats the sanctuary and the other the vestry and kitchen. Previously there had been two furnaces at the back corners of the vestry. Stove pipes ran through the vestry and up to the sanctuary to feed the registers on the outside aisles of the room. 1953 – Regina Nilsson Memorial Amplifier given by Rev. and Mrs. Maurer in memory of her mother. This system added speakers to the steeple that allowed recorded music or live organ music to be broadcast throughout the downtown area. 1958 – Interior of the building was redecorated by volunteers in preparation of our hosting of the annual conference. 1962 – A chapel is built in the rear corner of the vestry. 1963 – Western Auto building and land was purchased. The build was insulated throughout, a new front was added and nine rooms were created for church school. The building was consecrated and occupied in Dec. 1965. 1964 – The organ was entirely rebuilt by the Williams Organ Co. The console was changed from pneumatic to electro-pneumatic control and moved to the left side of the platform. 30 ft. cable connecting the organ and console was added so the console could be moved. Sliding center section of sanctuary platform, added in 1906, was removed and front of platform was built straight across with communion rail changed to match. New carpeting. 1970 – The 1861 parsonage was torn down to make a parking lot behind the church and a new parsonage was purchase at 9 Vinewood Lane. 1975 – Vestry and kitchen remodeled. Chapel moved to front of the vestry. 1979 - Link connecting the Coburn building to the main church was added and pitched roof added to Coburn building. Link contained church offices. 1998 – Organ was rebuilt and enhanced by Faucher Organ Co. New blower was installed in the Choir Room to replace the antique electric blower still found in the basement of the 1910 addition. Stenciling on pipes restored. 2000 -- Sanctuary refurbished with refinished floor, painted walls, new carpeting, and new lighting. 2001 – Coburn Educational Building and link torn down to make way for Whitford Building which included two stories, offices, chapel, classrooms, new chapel and elevator.